This project is shortlisted in the Workplace Under 1000 sqm Category of the 2016 IDEA Awards. The winners will be announced at the exclusive IDEA Gala Party on 18 November at Dockside Pavilion, Sydney. To join us for a night of celebration with this year’s winners, click here to secure your discounted Early Bird tickets. 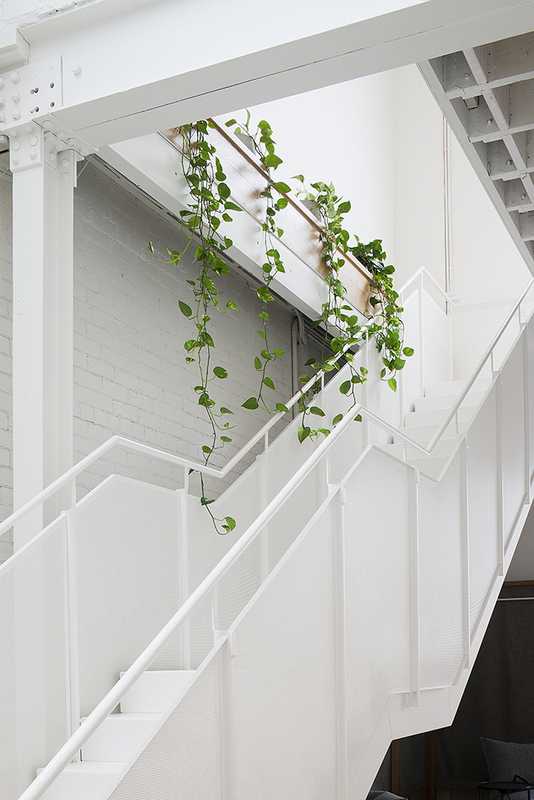 Evolution 7 is a digital agency based in Cremorne, Melbourne. Blessed with a great base building, the space is situated in a former warehouse facility and focuses on the simple lines and clean aesthetics of a traditional loft. The brief was to create a space that was light, bright and warm creating a relaxing environment for the staff, especially when working late hours. This was achieved through adding the timber flooring and joinery into the white warehouse shell and then overlaying this base palette with curtains, rugs, leather details and planting. Upon entering, you are welcomed by a seating area made intimate by a warm grey screen complete with leather detail mirror and magazine holder. Progressing through the studio, the interactive working space is organised in rows that lead toward the communal kitchen, which is focal point of the interior and key to the relaxed ethos of Evolution 7. Capitalising on the loft space, oversized bell lights are suspended above each of the computers to provide intimacy to each of the workstations. A winding staircase opens up to a mezzanine area that includes a private office, informal meeting table as well as break out space that overlooks the workstations whilst on the opposite end, a slim opening hints to a second mezzanine that leads to the boardroom featuring a large Trevor Mein print. 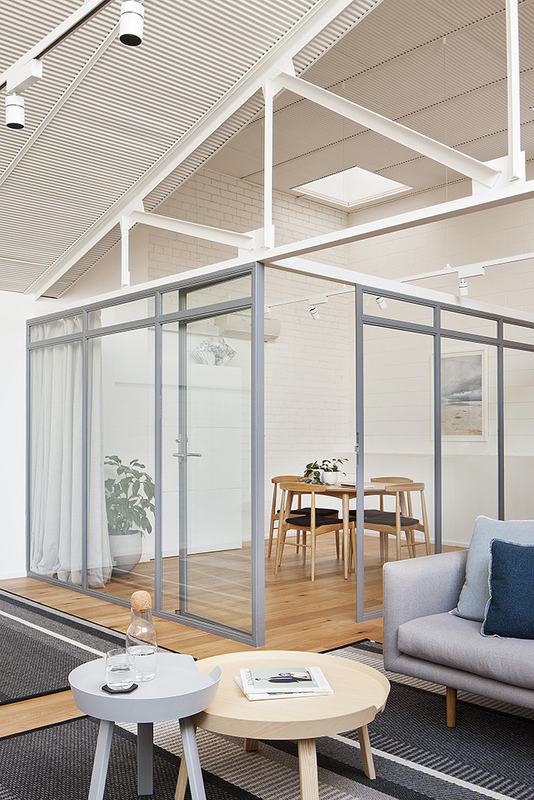 Practice creates entrepreneurial design hub with new office fit-out.